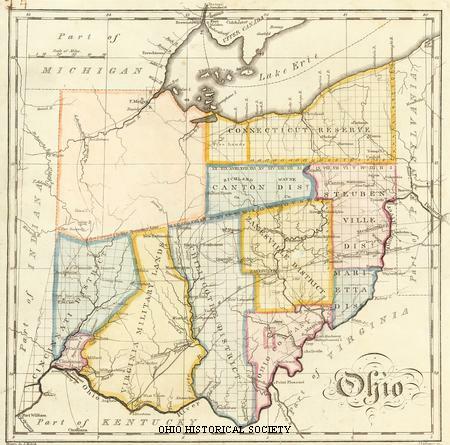 Map of Ohio drawn by John Melish, ca. 1813. The land office districts in Ohio, including the Virginia Military District, the Ohio Company and the Western Reserve lands are shown on the map. Also depicted is the border between the Native American lands in the northwest part of the state and the land settled by white pioneers. The map is hand colored and measures 9.45" x 9.45" (24 x 24 cm).